Melanie and Jarrod celebrated their summertime wedding at their beautiful country property. With a beautiful garden and verdant green lawn, this was such a lovely setting for a wedding. They popped up a tent for their reception and hosted the ceremony right on their front lawn. I absolutely loved all the colour I got to use in the flowers. Melanie was pretty open to my suggestions, and just knew that she wanted to use pinks and creams, with a summery, casual feel. I suggested that we tuck in touches of caramel and yellow to her bouquet, and absolutely LOVE the final result. I also loved the locally grown flowers that I got to use - the lisianthus and zinnias were perfect for Melanie's bouquet! For the aisle, we chose simple baby's breath bouquets and did some flower tie-backs for the curtains on the chuppah. Each of the tables in the tent had simple stem vases with pink and white blooms. Thank you to Janique Tessier Photography for these photos! Bridal Bouquet Ingredients: Hydrangea, Combo roses, pink lisianthus, pink and white zinnias, rice flower, and seeded eucalyptus. A few weeks ago, I worked with Amanda Douglas Events to style the Cielo's Garden open house. This is one of my favourite wedding venues in the Winnipeg area - it's just so beautiful! The clear top tent allows for the most charming views, making it easy to work with so many different colour palettes and styles. This means it's literally a bride's dream venue! I wanted to do a brighter, springy colour palette so Amanda Douglas Events and I chose blues and yellow, mixing in greens and terracotta tones. I've been wanting to incorporate terracotta into a design for a while now, so I jumped at the opportunity to add some terracotta accents into these table designs - on one table, potted herbs lining the table, and on the other table, a large terracotta tray serving as a base for several clean glass stem vases. Amanda selected some stationery from Robin Egg Blue Design and we added in these clear charger plates from Planned Perfectly, which I really love for the light way that it ties the look together. Thank you so much to Keila Marie Photography - I have a feeling that she's going to be in very high demand over the next few years, so brides and grooms, if you haven't yet had a chance to check out her work, be sure to do so and inquire about her availability! I've said it before, and I'll say it again: I absolutely love Cielo's Garden! 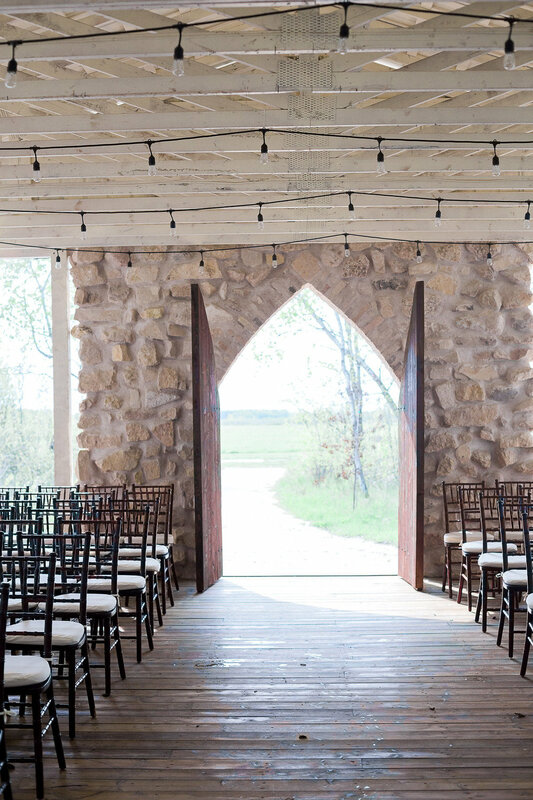 It is definitely one of my favourite Manitoba wedding venues and the little stone chapel in the woods is the most beautiful spot I can imagine for a wedding ceremony. Even better, it's incredibly versatile. The open rafters make it so easy to create a wide range of gorgeous designs! For the Cielo's Garden spring open house in May, I worked with Amanda Douglas Events and Planned Perfectly to design a simple but striking ceremony set up. We started with the draping, working with both white and champagne tones. The colours looked beautiful against the soft palette of the stones in the wall, and created enough interest that white on its own might now. I added in my custom-made dark wood stands, with two simple arrangements of flowering branches. Flowering branches are really only available in the springtime, but there are definitely other options that you could use throughout the summer and fall to create a similar style. I loved the light, airy feel these arrangements created in the space. Photos by the very talented Keila Marie Photography! Calling all 2016 and 2017 couples getting married at or interested in Cielo's Garden! Cielo's Garden is one of my absolutely FAVOURITE wedding venues in Manitoba. The clear topped tent is so unique and really allows for the beauty of our summers to take centre stage, and the stone chapel in the woods is SUCH a dreamy place for a ceremony. Seriously, this place is just amazing, and I'm so excited to have quite a handful of amazing weddings there this year. I can't wait to show you everything that I've dreamed up with my brides! On Wednesday, I'll be there at Cielo's with some floral tablescapes and ceremony decor, showing you different ideas for the room to be worked with at different budget points. I'll also be available to schedule flower consultations for your 2017 weddings, and I'll be hanging out with my pal Amanda of Amanda Douglas Events, who is one of Winnipeg's very TOP wedding planners and coordinators. 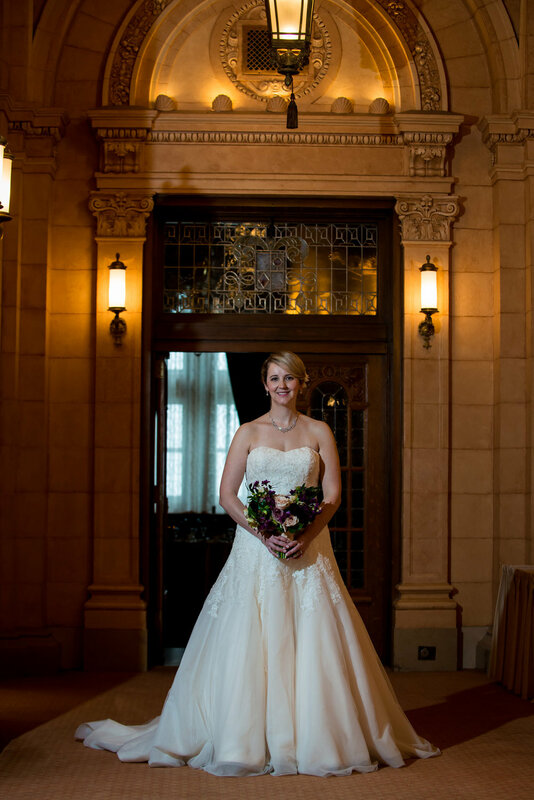 She offers both day-of coordination and full wedding planning, and she also loves working at Cielo's (and FYI, we love working together!). And now, here are a few pretty pics from a wedding I did at Cielo's last summer with Amanda and with Simply Rosie Photography!